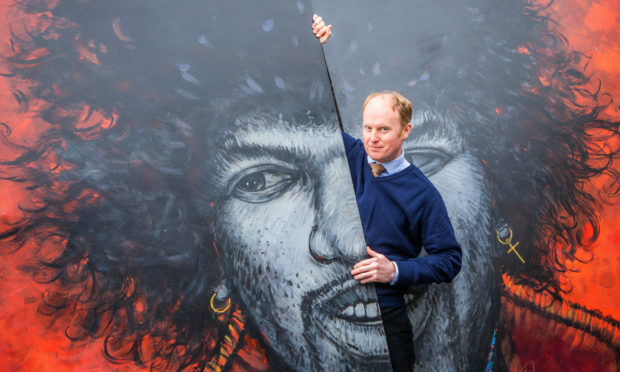 The 10ft by 10ft painting was created by local artist Ian Cuthbert Imrie, and was the first of his controversial rock stars series which sparked a row with council officers. The Hendrix painting was mounted on the exterior wall of the Giraffe Cafe in Mill Street in June last year. Now it is being sold off to raise money for the Giraffe group, which offers vital support, work experience and training to help people enter a work environment. Money will go towards a major refurbishment of the organisation’s South Street cafe. Operations manager Sarah Russell said: “We are so grateful that Mr Imrie donated this portrait to us and has allowed us to sell it to raise funds. The group decided to say goodbye to Jimi and use proceeds from the sale for ongoing refurbishment work. Sarah added: “We are aiming to re-open our place on South Street in two or three weeks’ time. The new look premises will also have easier access for all ages and abilities, as well as a wheelchair accessible toilet. The portrait will be sold by Lindsay Burns and Company at its auction on Tuesday. Auctioneer Nick Burns said: “We are delighted to be selling this to raise money for such a great cause. Mr Imrie was working in advertising when he met Hendrix at an album launch party in 1968. “Being more into jazz, I wasn’t that aware of Jimi but I remember this man who was very affable,” he said. Mr Imrie went on to create three more huge rock star portraits – David Bowie, Michael Jackson and John Lennon – and attached them to the side of a brick wall on Mill Street. But his impromptu outdoor gallery caused a stir when it emerged the owners of the building hadn’t given him permission.